Pedigree Dentastix Medium Dog has been manufactured to reduce up to 80% of tartar build-up when used daily. Plaque is a common problem in most dogs, when left untreated this can cause loss of appetite due to sore teeth and bleeding gums and more commonly, bad breath. The unique shape and abrasive texture of the chew helps to clean those hard to reach places between the teeth and gums, without the hassle of brushing. Having a daily oral care routine is important for your dog's health and well being. Each pack contains 2 delicious flavours of chicken and beef and is foil wrapped to maintain freshness. 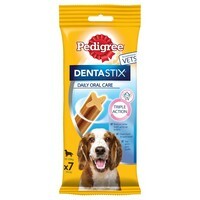 Medium Denta stix for dogs weighing 10Kg - 25Kg.